So I love to make canes when I say I love I mean I really love it! One of the recent canes I made was for a unique gift for a friend. 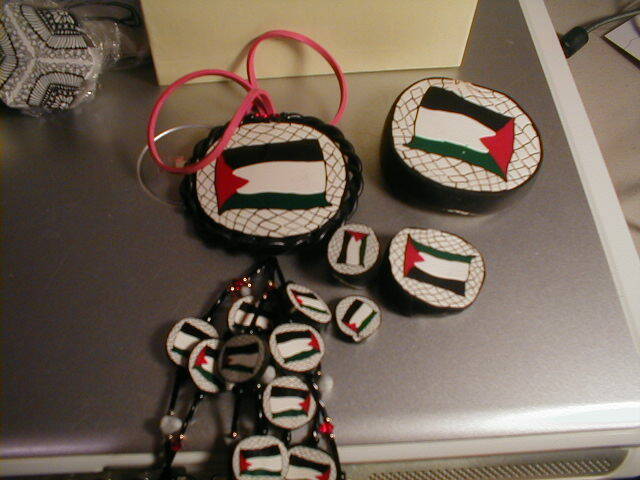 She is Palestinian and very proud of it. I am not going to get political here but I wanted to make something she could have to show exactly how proud she is. So I made her a one of a kind rear view mirror thing a ma jig and she liked it a lot but because of where she lives she was not able to hang it. I made one for myself I liked it so much and I am lucky because I am able to look at mine every day while driving. Of course I can see every corner that was not filled correctly so as to not distort the image when reducing but every artist is hardest on themselves. If there are any that do not do that I do no know who they are! This is not the one that hangs from my mirror its cold and I did not want to go and get it out of the car. This is an extra uglier cane slice ” just to see” it worked! This is a cane I made that ws inspired by a shirt. I wanted to recreate the intricate design. Here is a link to the shirt on my practice Flickr site. I also wanted to submit it to Polymer Clay Cafe so I have detailed pictures of this cane being built. If anyone wants me to I could post that one week. I built that baby perfectly maybe a little too much detail but I built that baby good! I am so blessed to have been able to take a class by Lynne Ann Schwarzenberg at about the time I made a terrible cut in the cane while trying to reduce. Lynn Ann and the wonderful hostess Seana graciously offered to reduce the mangled cane to help me. This is what came from their hands! They are the best cane reducers I have ever met. Okay so its winter and we had our first snow what better way to celebrate then to make your own snowflake? Here are my snowflakes by number you can search and find mine. Getting freeken inspired by making your own snowflake! So where does the snowflake come into play with clay you may ask?? 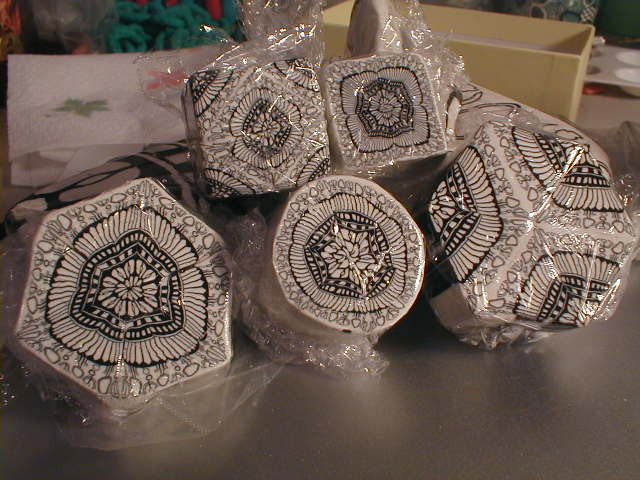 Well while making mine I realized that that stinking snowflake pattern is almost like a triangle for a kaleidoscope. Why don’t you play around and see what a log here or a long plug there will do to your kaleidoscope? You still have the reducing part to do and I am no help there but while watching Lynn Ann and Seana I have some ideas of how to reduce correctly. Guess another kaleidoscope is in my near future! This entry was posted on December 14, 2009 at 2:51 AM and is filed under inspiration. You can follow any responses to this entry through the RSS 2.0 feed. You can leave a response, or trackback from your own site.